It’s CHA Winter 2016 reveal time over on the Bella Blvd blog! There are 6 new collections, along with new embellishments and a huge Illustrated Faith release. We started the reveals earlier this week, and will be continuing all the way thru Monday of next week. Today we are sharing the new Cute Clips embellishments. I created a layout for the catalog, with a focus on the new Cute Clips. I love working on the embellishment focused layouts for the catalog, since I get to mix patterned papers and other elements from all of the new collections, rather than focusing on just a single collection. I used quite a few patterned papers from the new IF She Blooms collection, and then added a few patterned papers from the Sweet Baby Girl collection, Cute Baby Boy collection, and Sweet Sweet Spring collection. As soon as I saw a sneak peek of the Cute Clips, I had an idea in mind for my layout. It wasn't quite like what I ended up doing, but it did involve stacked pieces of patterned paper, with the little clips added to the top of each paper. I think my original idea was to go all the way across the page with the different papers. However, once I got going, I ended up creating a stacked row of papers, three inches wide, along the left side of the page. To the right of my layered papers, I used a strip of the floral patterned paper from the She Blooms collection, with a piece of white hearts Clear Cuts layered over the top to give it a more subtle look. The black and white large dot patterned paper is from the She Blooms collection as well. Part of the reason I decided to make these layered papers all three inches wide, is that I used most of the black/white 3x4" cards from a sheet of patterned paper in the She Blooms collection. It was a great way to get more patterns onto the page, from a single sheet of paper. I cut several smaller pieces of my different patterned papers, keeping them all three inches wide, and then cut an additional little piece of each that I used my favorite scalloped border punch on. I folded the scalloped pieces over the top of the larger pieces, and machine stitched it in place. I then spent way more time than was necessary arranging all of the pieces in an order that I liked. I adhered them, starting at the top of the page, layering them as I went. I made sure not to add any adhesive near the top of each piece, since I knew I would be tucking in my Cute Clips and some other label die cuts/stickers as well. Once I had the papers all layered down the page, I set out to find some coordinating label stickers and/or die cuts from the bits and pieces I had left (I didn't have all of the collections, or even full collections, for these catalog layouts). I tucked the labels, along with a coordinating clip onto most of the layers of papers. I loved the aqua heart patterned paper from the She Blooms collection, and thought it was my best choice to add to the right side of the page, where my title would go. And for my title, I picked out a few words from our new Chip Scripts chipboard words. These words all come in plain white, and can be left as-is (which I did because they looked great as-is), or painted, inked, or altered to fit your needs. I also picked out a few of the stickers from the She Blooms collection to add above my title, as they really tied in with my journaling. I added the pink chipboard heart from the Sweet Baby Girl collection, along with a handful of enamel dots in several colors. I didn't have any set photos in mind when I started this layout, but quickly came across these photos of another one of my previous daycare girlies. Amanda was with me for years, was just a year younger than Sarah, and was best friends with my girls for years. She was honestly like a third daughter to me when she was younger, and I had always said that about her. Just a little over a year ago, as a freshmen in high school, she went into cardiac arrest in the classroom, where she had CPR performed on her for a half hour before EMS could get there. She came so very close to not being with us anymore, and it's a true miracle that she's alive today. While we don't see her that often these days (Sarah sees her at school), and she's not a big part of our lives anymore like she used to be, she is still a very special young lady to us all and we're so thankful that everything turned out ok for her. Head on over to the Bella Blvd blog, HERE, to see the entire Cute Clips release, piece by piece, and to enter the drawing for a chance to win-it-before-you-can-buy-it! The randomly chosen winners for ALL of the reveal giveaways will be announced on Saturday, January 9th. It’s CHA Winter 2016 reveal time over on the Bella Blvd blog! There are 6 new collections, along with new embellishments and a huge Illustrated Faith release. We started the reveals yesterday, and will be continuing all the way thru Monday of next week. Today we are sharing the new Sweet Baby Girl collection and the Cute Baby Boy collection. I worked with the Sweet Baby Girl collection for the catalog, and created the layout above. The colors of the collection made me think about these photos of a previous daycare girlie of mine, Haley. I'm pretty sure I used her photos when I worked with the older baby collection several years ago too. Seems that she's my go-to baby girl. Lol. The disadvantage of having all of my girls baby photos on film and not as easily accessible. I wanted to incorporate several of the chipboard animals from the Chipboard Icons sheet, and decided to create four columns on the page to create sort of a block/grid design. I used one patterned paper for each column, adding my photos into three of the four columns. This helped to create several smaller blocks of patterned paper in which to arrange my title and embellishments. I've always considered myself a B-side scrapper, as I gravitate towards the tone-on-tone patterned papers more so than the busier patterns. I chose a few of the tone-on-tone patterns for three of my columns - the pink hearts, the purple dots, and the yellow swirls. I also trimmed up some white confetti Clear Cuts transparency pieces to layer over the purple dotted patterned paper and one of the blocks of yellow swirl patterned paper. I then added the cute little chipboard animals to a few of the blocks, and worked in a few of the Paper Pieces die cuts too. 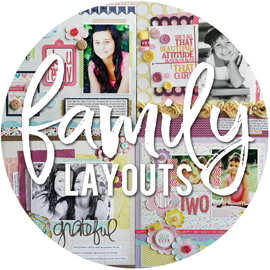 I cut up the yellow scalloped border sticker and used it above/below a few photos, and tucked in a few tab die cuts above my photos as well. The final embellishments were these adorable little bow clips, which we will officially be revealing on Thursday. The floral patterned paper was the busier paper that I chose to work into the page, and I used a thinner strip of that for one full column. I added the darker pink scalloped border sticker along one side of the floral patterned paper and then added white and pink enamel dots to some of the flowers. For my title, I used the "girl" chipboard letters from the Chipboard Icons sheet, and added the "sweet" chipboard word, which is from a new embellishment we'll be revealing later this week. I needed some white on the page to break things up, so I ran a piece of white textured cardstock through a woodgrain embossing folder, spritzed it with pink misting spray, and used it to hold my title. Head on over to the Bella Blvd blog, HERE, to see the entire Sweet Baby Girl collection and the Cute Baby Boy collection, piece by piece, and to enter the drawing for a chance to win-it-before-you-can-buy-it! The randomly chosen winners for ALL of the reveal giveaways will be announced on Saturday, January 9th. It’s CHA Winter 2016 reveal time over on the Bella Blvd blog! There are 6 new collections, along with new embellishments and a huge Illustrated Faith release. We are starting the reveals today, and will be continuing all the way thru Monday of next week. Today we are sharing the new Let's Go collection. I created this layout for the catalog, using some photos I borrowed from my good friend Erin Terrell Clarkson. When it comes to travel photos, she always has amazing pictures. I'm extremely limited on travel photos, so I went straight to Erin. I'll be totally honest here, and tell you that I only had three patterned papers to work with for this layout, as the full collection wasn't ready at the time. There's definitely a lot of white on this page, whereas after seeing the full collection (after creating this), it's full of colorful patterned papers. When doing catalog work, I also work with mock up products when it comes to papers and stickers. Which is why my cute little green scalloped border "sticker" wasn't quite the full twelve inches it should have been to go the full length of the page ;) I decided to use the white and grey airplane patterned paper for the main part of my page, where I knew my title and embellishments would go. I knew they would stand out the best against that paper. I used the text patterned paper for the sides of the page, making the left side quite a bit wider than the right side. I worked the aqua airplane patterned paper into the bottom of the page, below my two photos, where I knew my journaling strips would go. For my title, I combined the "go see do" from the chipboard icons, the "travel" die cut from the paper pieces die cut package, and the word "together" which is from one of our new chipboard sheets (coming later this week). I ended up outlining the word "together", along with some of my other die cut pieces, with a black pen to help them stand out a bit more against the white and grey patterned paper. I really love that the paper pieces are back. The new die cut packs have a lot more designs to choose from, and they're different for each collection. Our previous paper pieces had all of the same shapes, just different colors/sayings, for each collection. I incorporated a few banner pieces, a fun tag, the word "travel", and several clouds from the package. I also worked in a few chipboard elements, with the clouds and the airplane. Head on over to the Bella Blvd blog, HERE, to see the entire collection, piece by piece, and to enter the drawing for a chance to win-it-before-you-can-buy-it! The randomly chosen winners for ALL of the reveal giveaways will be announced on Saturday, January 9th. Just a little over a year ago, I set out on a mission to tackle 6 years worth of Christmas photos that had never been documented and get them scrapped and in the albums. You can read more about this HERE, if you haven't read it already. 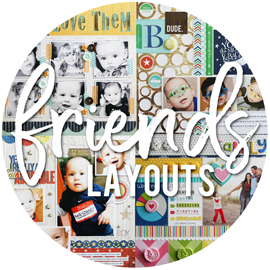 I feel like I've repeated a lot of this while sharing each of the layouts I've created over the last year, but I'm going to do a little re-cap anyways! I thought it would be cool to share all of the layouts in one single post. A quick refresher. I relied heavily on Kerri's Storyboard templates for this project, and created 16 different photo collages, that included a total of 143 photos. These collages covered 6 family get togethers from those 6 years, as well as 3 Christmas mornings with just our little family. In the end, my plan was to end up with 6 two page layouts and 3 single page layouts. Well, it's taken me a full year (and a month, if you want to get technical), but I've finished all 9 of those layouts! This design was a popular one with me. The full page photo collage, with a smaller collage on the opposite page. I've used this design numerous times for birthday layouts as well. It's just a great design for getting gobs and gobs of photos on the page. Every now and then, when working on these layouts, I would start to worry that they looked too much the same. With the same basic design, same photo collages, same title placement, etc. I was constantly reminding myself that I went into this project just wanting to knock these layouts off my list. I've mentioned how I don't necessarily enjoy scrapping Christmas's, so I didn't want these to be layouts that I stressed over. If using the same basic ideas over and over helped me tackle something that I don't enjoy, then more power to me. For most of these layouts, I just dug into my stash of Christmas product to see what I could use up. I did however, dig into my everyday papers as well. This layout is an example of that. I don't believe there's anything on this page that was meant to be a "Christmas" product. I always pull my colors from the colors in my photos, so the photos really dictated my color schemes, even if they weren't the traditional Christmas colors. 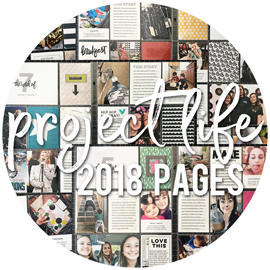 Another thing that made these layouts quick and easy, for the most part, is that they're hugely made up of patterned paper, die cuts, and photo collages. I die cut titles with my Silhouette Cameo for every single layout, and on a few of them, I also die cut a few additional pieces for the page. I kept the embellishments super simple, with maybe a few enamel dots, buttons, brads, or pre-made 3x4" cards. And after looking at all of these layouts together, I guess my love of my scalloped border punch from Stampin' Up really shows! I do love that punch, and it's my go-to border punch when working on projects. I think I used it on six of these nine layouts. I do own other border punches, for the record, so I should show them all some love every now and then. I keep a 12x12" Iris container that's filled with Christmas themed product and patterned papers. It was so easy to just pull out the box and see if I had anything to coordinate with my photos. I certainly didn't plan on using glittered foam Christmas trees on the design of this page. But as I was digging thru the box, I pulled them out and thought they'd fill in some space on the page. So why not. I also love that this project gave me a chance to use up some product that I've been holding onto, with only one project in mind. I remember getting this Christmas collection from Chickaniddy over a year ago, when I guest designed for them, and at first glance, I didn't think it was something I would use. But the collection colors worked perfectly with these photos, so I held onto it, knowing I would use it for this layout and most likely this layout only. This layout looks soooooo similar to the first layout I created for this project, and that's totally fine with me. The beauty of using the same design, is that it saves you time from having to come up with a whole new design, over and over. And because these layouts are all from different years, they're not going to be side by side in any albums or anything. So no one is really going to notice that a few layouts are similar to each other. I also went into these layouts knowing that I most likely wouldn't include any journaling on most of them. Especially the ones documenting family get-togethers. I don't want it to sound like the holidays are boring and monotonous. Because they're not. However, they usually include the same family members, we're usually at the same house, eating the same foods, opening gifts and doing our pick-a-gift exchange game. 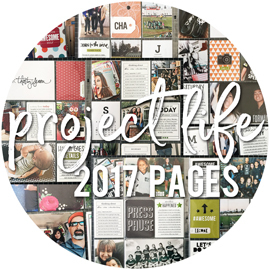 So I don't necessarily feel like I need to add journaling to those pages, as it would most likely say the same thing, year after year. So, what's next? I have Christmas 2014 to do still. I never did edit those photos, so once I edit them, I can get that layout knocked out. And with Christmas 2015 just a few days away, I will have that to scrap as well. I believe I have one more Christmas that was within my "digital years", so that's one more I need to take care of. If I want to continue with the earlier Christmases, it will involve film prints and/or negatives. We'll see how up to that I'm feeling. Otherwise, I'd love to tackle the girls birthday's in the same way, and get those all taken care of. We'll see what I'm feeling inspired to tackle once the new year comes around. 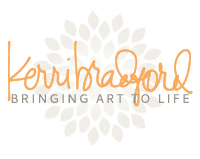 I've got a new layout up at Kerri Bradford Studio today. In my quest to get 6 years of Christmases scrapped, documented, and in the albums, I finally reached the last of the 9 layouts I set out to make over the last year. Kerri's storyboard templates played a huge part in these layouts coming together easily and without much fuss, and I love that! Every layout I created involved photo collages, and die cut titles, and minimal embellishments. By simplifying my process, it helped me tackle a holiday that I don't necessarily enjoy scrapping. For this layout, I used a template from Kerri's Storyboard #6 kit and sized it so that I would have a little room on both sides of the collage for some patterned paper and a little room above for my title. I had printed my collage in both color and black & white, since I wasn't sure which one I would want to use. These photos turned out very "flash-ey", and colors were a bit off to me. But in the end, I did decide to go with the color version. I combined two designs for my title, pulling the word "joy" from the Christmas Countdown kit and the word "Christmas" from the December Twenty-Five kit. I also used one of Kerri's fabulous freebies, and cut the Border Fancy to go along both sides of the collage. I kept this layout super simple, and just added a chipboard piece and some number stickers to add the year. Easy peasy. I'll be sharing a recap of all nine completed layouts and a little wrap up of my Tackling Christmases Past projects early next week. In the meantime, make sure you're heading over to Kerri Bradford Studio to take part in all of her 12 Days Of Christmas activities. There's been so much inspiration, so many freebies, and a few giveaways shared over the last 10 days, and there's still 2 days left! It's the first Monday of the month, which means it's time for a new monthly project sheet layout to go up on the Bella Blvd blog. For this month, I was asked to focus on the Make It Merry collection. This is a smaller collection than most Bella collections, as it is meant to pair up with our Christmas Cheer collection from last year. I set out knowing that I could bring in a few other pieces if needed, but I ended up sticking to just the Make It Merry collection. As for the handsome little boy, that's Zachary, my cousin's son and a cute kiddo that I also had the pleasure of taking care of for a few years when he was little. When I looked at this collection, these photos of him were the first ones that came to mind, and I knew they'd be perfect. I also knew right away that I wanted to use white cardstock for the background of my page, so that the reds and greens of the patterned papers would really stand out. I just love how the black star Clear Cut transparency looked laid over the white cardstock, and it picked up the touches of black in the Santa patterned paper. I adhered the Clear Cut using glue dots along the top and bottom edges, and I also added a few glue dots to the center of the page, as I knew my photo/papers would cover that up. I then added some strips of pattered paper and the scalloped border stickers along the top and bottom of the page, which covered up the glue dots along those edges. I machine stitched along the top and bottom as well, to really secure things. I picked out three patterned papers - a green tone-on-tone print, a red with white triangles print, and the cute Santa print - and layered them one on top of the other, along with my photo collage. I printed my collage as a 5x7", so you could easily use a single 5x7" photo instead. I thought the little tab stickers worked really well tucked into the different layers of papers. For my title, I used the white alpha stickers from the Treasures & Text sticker sheet, along with the red Amorie chipboard alphas. I was worried the white alpha stickers wouldn't show up that well, once I had my white background picked out. But since I partially layered them over the patterned papers, it worked out. I love to distress the edges of my patterned papers on most of my layouts. It takes no time at all, and adds a lot of texture to the page, so the papers don't appear so "flat". I also machine stitched around the edges of each patterned paper, before adhering the entire layered piece to the center of the page. You can download and/or print a copy of this month's project sheet, complete with a full supply list and detailed instructions, RIGHT HERE. It's that time of year again! It's December, which means it's time for the Twelve Days of Christmas celebration over at Kerri Bradford Studio. Everything kicked off this past Monday, which you can find right HERE. You'll want to make sure and stop by each day, as she's got one-day-only Christmas freebie designs that you won't want to miss. There will also be other goodies, projects from her designers as well as some other guest designers that are stopping by to visit and share, and of course a giveaway or two. 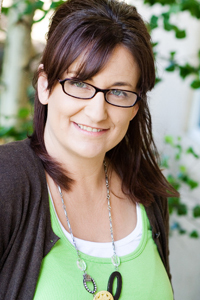 And today, I've got a new layout up on Kerri's blog. I've been knocking out the last few layouts for my Tackling Christmases Past project, over the last month or so. This layout here is one of the last ones I had left, and it's very similar in design to what a lot of my layouts ended up looking like. The entire reason that I had those 6 years of Christmas's that hadn't been documented (along with a few more years from my film days, which still need to be taken care of) was that I don't enjoying scrapping Christmas layouts. Not sure why. I just don't. Which is why I went into this project knowing that I would keep these layouts simple and quick. You know that saying, "if it isn't broke, don't fit it"? Well, I totally apply that to my scrapping. If I have a page design that works, I have no problem using that design over and over again. It simplifies things for me, and lets me get more done. This is one of those page designs, especially for a two page layout, that has always worked well for me. I've used it a ton, whether it was a Christmas layout, birthday layout, or an everyday layout. A while back, I got to work with Echo Park's The Story of Christmas collection for a layout that is in the winter issue of Scrapbook & Cards Today. Once I was finished with that layout, I figured that I might as well create another layout with it, since I already had all of the products out. The colors in the collection went perfectly with these photos from Christmas 2011. I combined two cut files to create my "Merry Christmas" title. While the Here Comes Santa Claus kit has a "Merry Christmas" that's all one cut file, I decided I wanted a taller, all uppercase "Christmas", which I found in the Christmas Countdown kit. If I'm being honest, I actually used this same exact title on my layout for S&CT. I used different patterned papers, and did a little layering/shadowing with a second cut, but yes, same title. Like I said, if it's not broke, no need to fix it! I really liked the border strip with the cute little banner pieces on it, but it was a little too big for my liking. So I went really old-school, and did a little "tearing" technique to make it smaller. Ok, so tearing really doesn't count as a "technique" I suppose, but I don't get all that "technique-ey" anymore, so I'm going with it. I also used one of the 3x4" cards from one of the patterned papers, and tucked the bottom under the top of my photo collage next to the title. It's something I've done on a few of the Christmas layouts and I like the way it looks. For this layout, I created two separate photo collages. Since I aim to get all of our photos onto the page, I created a full 12x12 collage for one side of the two page spread, and then a smaller collage for the opposite page. Both of the collages used on this layout came from Kerri's Storyboard #7 kit. I stuck with some very simple embellishments, using a few of the brads and enamel dots that came with the collection. And lots of machine stitching of course. So make sure and visit Kerri Bradford Studio all this week and next, so that you don't miss a thing. And I'll have one more Christmas layout to share for her sometime next week! Just popping in to let you know that today is the day that the Winter issue of Scrapbook & Cards Today is available to view and/or download, completely FREE, online. You can also get print issues with a subscription (HERE), for just the price of shipping and handling. If you've never had a chance to hold this magazine in your little hands, you're missing out. I love the online version, and it's awesome that it's completely free to view. But there's nothing better to me than having a magazine in my hands, to flip thru over and over. It's such a high quality publication, with nice thick pages. Either way, check it out! 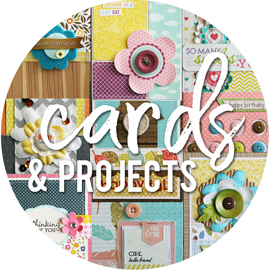 I have a new layout up on the Scrapbook & Cards Today blog today. I do four blog posts a year over there, and when it came time to start thinking about what I was going to create for this post, I started thinking back to the last post I did for the 2014 year, which was in November 2014 (found HERE). I realized that I had shared the new approach I had decided to take to tackling the years of Christmas photos that I had never gotten around to documenting. I had shared my first two layouts (both two pagers) from this project on that post, and I figured with this post being my last post on the S&CT blog for 2015, it would be the perfect time to share another layout from this same undertaking. Just a quick refresher on this project and my plans for it (you can read more about it in full HERE). My goal when it comes to scrapping holidays and events is to get the entire celebration on the page. I am not one to do a large number of layouts every Christmas, with a single photo, or maybe two or three photos on a page. If I'm going to take the time to scrap Christmas, I'm going to use ALL the photos at once, and "get it done". That just sort of goes in line with my style and how I like to scrap. I had a plan to get all of these photos, from 6 different years, scrapped quickly and without much fuss. And that plan heavily revolved around photo collages. It's the best way to get LOTS of photos on your pages, in a neat and organized way. I like clean looking pages, and photo collages are great for just that. For this layout, documenting Christmas morning with my girls back in 2008, I had created a large photo collage for one side of the page, and I had two main photos that I printed as 4x6” prints. I’m a firm believer in turning to the colors in your photos when it comes to picking out your patterned papers and embellishments. I’ve been holding onto this older Jolly Good Christmas collection from Chickaniddy Crafts that went really well with these photos. I don’t see pink or even the lighter green pop up in our Christmas photos anymore, so I wanted to make sure and use this collection once I realized how well it matched with these older photos. Since I fit the majority of our photos into the photo collage for the second page, I choose two main photos to include on the first page. Since they were both 4x6”, I adhered them side by side across the page, which gave me plenty of room above and below to play. Actually, they weren't a true 4x6", since there's a gap in between the photos. Lol. I find it so annoying when things aren't the exact size they should be. The white and grey circle patterned paper was perfect for the background of this page, as it was subtle enough to let all the other elements stand out against it. This entire layout is pretty much all patterned paper and photos, with a touch of cardstock in my title. I even cut the “Ho!Ho!Ho!” and “The Magic of Christmas” strips from a sheet of patterned paper. My title is straight from the Silhouette store, and I cut it using both patterned paper and solid cardstock. I love titles that include both a cursive font and a clean font with straight lines, and this title had both. The only real embellishments that I included on this layout were some enamel dots that I added to some of the flowers on the floral patterned paper. I even fussy cut some of these adorable pink and red flowers to add to the first page of the spread. It’s such a quick way to bring in a touch of that floral patterned paper to the opposite page, without adding a large piece of it. I'm pretty sure I've said this in every post related to this "tackling Christmases past" project, but it’s worth repeating. I figure if using the same basic design, some of the same elements, and even the same photo templates helps me tackle something that I’ve been avoiding, then it’s all good. I would rather create quick and easy pages and “get it done” … then to keep pushing these photos and memories aside, all because they’re subjects or themes that I either don’t enjoy doing, or am too overwhelmed to dig into! I have two more Christmas layouts to share during the next week, which will bring this project to an end. Sort of. Once I share the last layout, I'll be doing a post to share the progress I made, some final thoughts on how I went about this, and what comes next related to this same project.